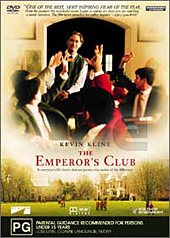 On the "Special Features" menu, go right from 'Trailer' and a smiley face appears on the chalkboard beside Kevin Kline's head. Click for a trailer for Life As A House. On returning, go up from there to highlight the equation e=mc2. Click for a trailer for In & Out.